You are currently on the biography page of the Vinny Pinto central directory website. I wear several hats in this life, but I work primarily as an independent multi-disciplinary research and consulting scientist-engineer for clients across the world; I have consulting clients on every continent with the exception of Antarctica. I have a Master's degree in the health sciences, and also have university graduate-level training in several other fields, including psychotherapy (clinical psychology), statistics and acupuncture (including Taoist, latter-day Chinese systems, Five Elements systems and European systems), and my extensive undergraduate-level university training includes concentrations in electronics engineering, physics, astrophysics and psychology. My scientific consulting work spans several fields, including beneficial syntropic antioxidative microbes (SAM), bioremediation, sustainable agriculture, human and animal nutrition and health, quantum and subquantum physics and time-space continua technologies. Interestingly, I am one of those rare persons in the scientific and engineering fields who is deeply steeped in activities of the spiritual realm as well; I am a mystic, and have been involved in metaphysical and mystical pursuits since a very early age, and have trained in a number of mystical traditions over the years. I have consulting clients on every continent in the world except Antarctica, and have performed on-site consulting and training seminars across the USA and in Nicaragua and India; I perform much long-distance consulting for clients in Australia, Europe, Africa, India and Canada. I have authored two books on use of beneficial syntropic antioxidative microbes (SAM) in the fields of health and agriculture, and am currently preparing three more related books for my publisher. Several non-profit companies and commercial vendors market audiotapes and video DVDs of my live seminars in the realm of in agriculture and human nutrition. My Master's degree in the health sciences was earned in 1992 from Indiana University of Pennsylvania in Indiana, PA; I have also studied acupuncture at the graduate level in an accredited graduate school. For further details, please see the section below. 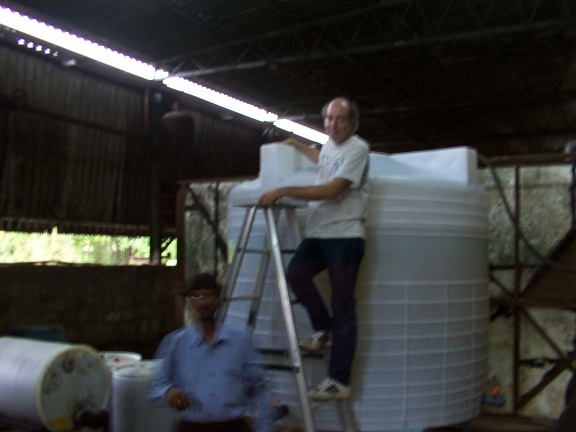 Seen above is a slightly blurry photo taken of me (on ladder) checking on a brewing vat being filled at a client site in southern India in September 2005; we were in the process of fermenting beneficial syntropic antioxidative microbes to be used for industrial waste treatment. I am a multi-disciplinary scientist-engineer, with a graduate degree (Master's level) in the health sciences, and also with a strong educational background in clinical psychology, physics, quantum physics, astrophysics, engineering (electronics engineering and mechanical engineering), acupuncture, epistemology and theology of world religions. I have also trained at the graduate level in acupuncture and have further trained in a number of traditions of acupuncture and oriental medicine. I work extensively as an R&D and formulations consultant in the world of nutritional antioxidants and beneficial syntropic antioxidative microbes (SAM) and their uses in human and animal nutrition, and in the use of beneficial syntropic antioxidative microbes in agriculture and in bioremediation of waste. I render consulting work worldwide on using beneficial Paleolithic-era microbes, including syntropic antioxidative microbial consortia, in environmental applications, agriculture and waste remediation. I have consulting clients in this area on every continent except Antarctica. I presented lectures and seminars on beneficial syntropic antioxidative microbes in agriculture for seven days at the 2006 annual Acres USA conference held in Indianapolis, IN in December 2006; some of the lectures were audiotaped and are available from Acres USA media store. I also lectured on beneficial syntropic antioxidative microbes in agriculture at a seminar held at Shepherd College in Shepherdstown, WV in April 2005; that seminar has since been rendered into a set of 3 DVDs which is available from several sources. My free informational website on beneficial syntropic antioxidative microbes (SAM) may be found at sam.vmicrobial.info. I have published two books so far on syntropic (i.e., negentropic or anti-entropic) antioxidative microbes, and am currently working on several books in each of several fields in the applied sciences. On my first pass through university-level studies, back in the 1970s, I studied the sciences, astrophysics, physics and quantum physics, and electronics engineering. After a long stint working with UHF and microwave weak-signal recovery, I then spent many years away from the university environment, working largely as an electronics design engineer and performing research on atmospheric physics and geophysical electromagnetic phenomena, particularly at VLF, ELF and LF frequencies. In the late 1980s, I embarked upon a long doctoral graduate training program in clinical psychology. After a few years, I decided that the field was not for me (I felt that there was not enough spirit and heart in it...) and I switched to a very broad graduate program in the health sciences and in scientific experimental design and statistical analysis (yes... I know, it sounds really nerdy, doesn't it? ), and eventually earned a grad degree covering both realms (health sciences and research/statistical methodology.) I then spent a year in a graduate-level acupuncture training program, and some time in other studies in acupuncture and oriental medicine, followed by eight years at the management level in the corporate world engaged in guiding research in behavioral healthcare. As you may have been able to surmise from reading so far, my life has zig-zagged across many fields and many careers. This zig-zag aspect of my life has been wonderful, as it has given me experience in a great many disciplines, and this has meshed with my natural ability to build bridges across many rather diverse fields, including the rather obvious intersection of quantum physics and mysticism (aka metaphysics.) I had an electronics and science lab in my bedroom starting at age five, and was a ham radio operator before the age of ten. Despite all these left-brained interests, I also received inner guidance at an early age to fully explore the worlds of mysticism and meditation, and thus I spent long days from age 13 onward in metaphysical and mystical bookstores in large cities on the East Coast. I started a practice of daily meditation at about age 13, and never stopped. I eventually studied mysticism, spiritual opening and meditation with many teachers and at many centers and monasteries -- across many traditions, including Zen, yoga, Chi Kung (aka qi gong), Buddhism and Christian mysticism -- from age twenty until well into my forties. Likely because of this background in mystical and spiritual pursuits, I have always had a rather open mind about the possibility of the existence of bioenergies, biofields and subtle energies, and magical occurences do not surprise me at all. I often provide services as an R&D and formulations consultant in the world of nutritional antioxidants and beneficial syntropic antioxidative microbes and their uses in human and animal nutrition, and as an R&D and applications consultant in agriculture, waste remediation and odor management. In fact, while I spent a modest amount of time performing consulting work in formulation of nutritional antioxidant products, the bulk of my work with beneficial syntropic antioxidative microbes is devoted to consulting worldwide on the use of beneficial Paleolithic-era antioxidative microbes, particularly antioxidative syntropic microbes, in agriculture, waste remediation and odor management; I have consulting clients in these realms on every continent except Antarctica. I presented lectures and seminars on beneficial syntropic antioxidative microbes in agriculture for seven days at the 2006 annual Acres USA conference held in Indianapolis, IN in December 2006, including a major 2-day presentation at the pre-conference university; some of the lectures were audiotaped and are available from Acres USA media store. I also lectured oncbeneficial syntropic antioxidative microbes and agriculture at a seminar held at Shepherd College in Shepherdstown, WV in April 2005; that seminar has since been rendered into a set of 3 DVDs which is available from several sources. I have delivered similar seminars in smaller local venues across the USA and on two continents. My free informational website on beneficial syntropic antioxidative microbes (SAM) may be found at sam.vmicrobial.info. I have published two books so far on syntropic (i.e., negentropic or anti-entropic) antioxidative microbes, and am currently working on two additional books in that field. 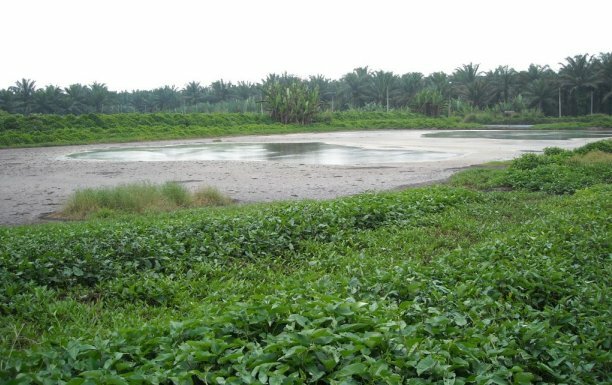 This image shows one of a series of waste lagoons at a palm oil processing plant in Malaysia where my consulting client will be conducting pilot studies on the use of beneficial syntropic antioxidative microbes for treatment of toxic and odoriferous wastewater. Photo was taken in mid-2008 during Vinny's consulting trip to Malaysia. 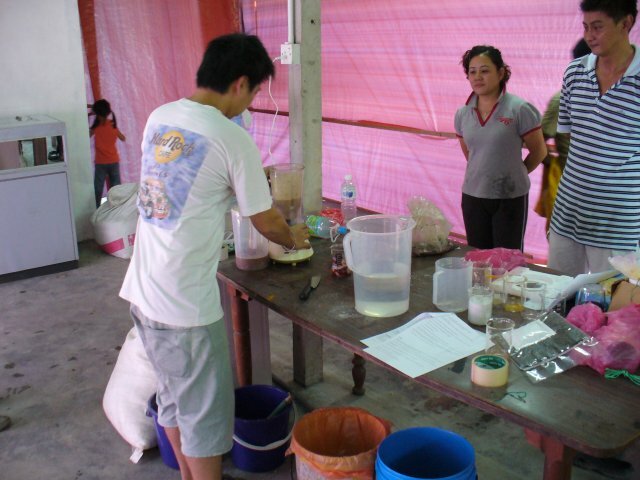 This image shows staffers at a client facility in Malaysia mixing up ingredients for a 210 liter pilot batch of a beneficial microbial culture, rich in PNSB microbes, for use in pilot waste remediation projects and studies in Malaysia. The person shown working at the table is Jeff, the project manager. This photo was taken by Vinny during a mid-2008 consulting trip to Malaysia. I have done research since 1978 in the realms of mineral nutrition, particularly in the area of trace element nutrition. I have followed the whole phenomenon of so-called ormus or monatomic forms of minerals very closely since the mid-1990s, and have been involved in testing of some ormus products and was also intimately involved in debunking some rather outrageous claims being made for one such commercial product in the late 1990s. I have also worked at times as an R&D consultant for three commercial ormus product vendors, helping them in testing their products, in improving methods for producing ormus-type compounds, and in verifying or validating various product claims. I also have wide experience in using antioxidative syntropic (negentropic or anti-entropic) beneficial microbes for biotransformation or biotransmutation of minerals into so-called ormus form. I have been doing research (including laboratory-based research and development) in the entire field of "subtle energies", "scalar" fields, and "quantum noise quieting" or "quantum coherence" devices which seem to ameliorate at least some of the harmful effects of EMF fields from modern manmade technology since 1974. And, I have, at times, designed and built various devices in my lab for the purposes of producing local-field quantum coherence, or local-field quantum noise reduction, or, as I often love to phrase it, to facilitate the "restoration of coherent space." In fact, it was these interests which let me to eventually create, in 2006, my Coherent Space website. Much in line with my earlier-mentioned background in electrical engineering, physics and astrophysics, and also in line with my above-mentioned interest in bioenergies and subtle energies, I have amassed considerable experience over the past 26 years in the realm of studying the effects on water, foodstuffs and living organisms of electric fields, magnetic fields and EMF. I am one of those odd persons who is both a scientist/engineer and a mystic; I am equally comfortable in the world of science and engineering and the world of Spirit and Supreme Heart. While -- as mentioned above -- I work primarily as a research and consulting scientist in the fields of nutritional antioxidants and beneficial syntropic antioxidative microbes, I am also a spiritual healer (no charge for healing work) and I always feel best when I am equally grounded in both of these realms. 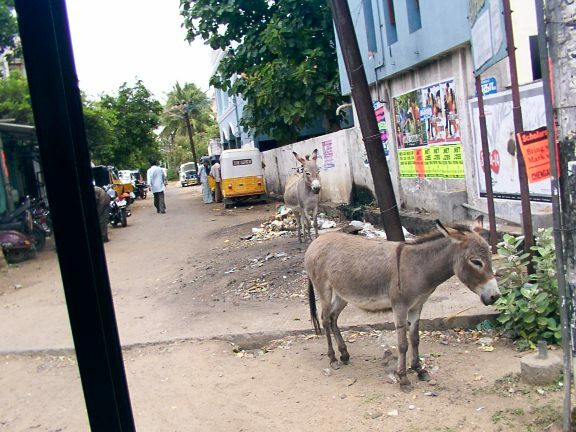 The above photo is a street scene which I shot in September 2005 in a small city in southern India, not far from Chennai, and just a short distance from one of my consulting sites for industrial waste bioremediation. 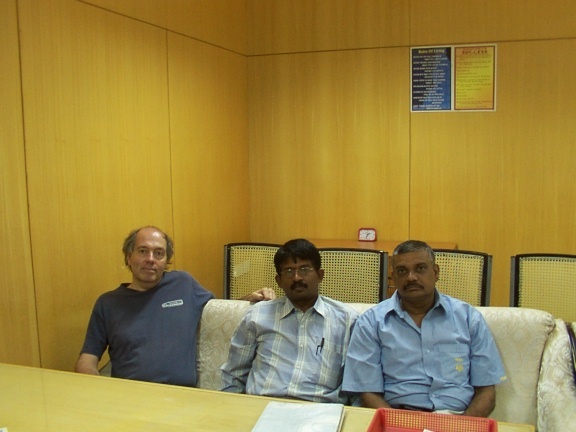 The photo above was taken in September 2005 at one of my industrial client sites in Southern India, near Chennai. Shown also in the photo is the company's chief scientist (center) and the plant manager (right). 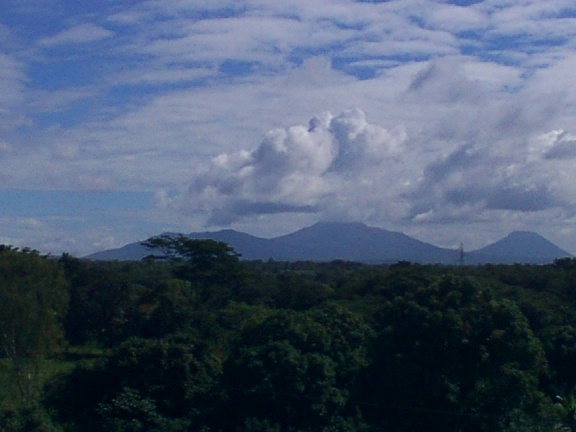 The photo above shows the peaks of four volcanoes in western Nicaragua, two of them somewhat active on the day on which I took this photo in November 2005. The photo was shot from the site of an industrial client while I was visiting the site on a waste bioremediation consulting job.